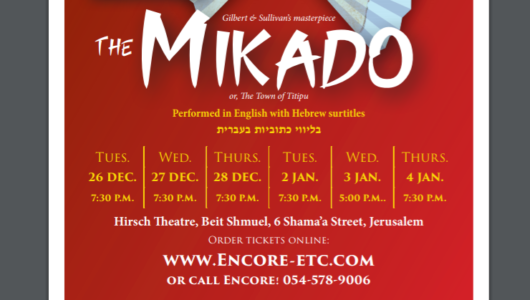 THE MIKADO marks a return to Jerusalem in celebration of Encore’s 10th anniversary! Gilbert & Sullivan’s perennially popular comic opera, The Mikado, returns to the Jerusalem stage with Encore’s special tenth anniversary production on 26-28 December 2017 and 2-4 January 2018 at the Hirsch Theatre, Beit Shmuel, 6 Shama’a Street, Jerusalem. Evening performances will be at 7:30 p.m. and a 5:00 p.m. matinee on Wednesday, 3 January. Featuring a cast of fifty – with full orchestra, magnificent sets and costumes – the melodious masterpiece is a satire of human foibles and fantasies set in an imaginary world of a Victorian’s concept of faraway Japan. Nanki-Poo, the son of the Emperor, in disguise as a wandering minstrel, loves Yum-Yum, the ward of Ko-Ko, a cheap tailor suddenly promoted to official position, but the road to marital happiness is strewn with legal, bureaucratic and absurd obstacles. Suffice it to say, all goes out right in the end and all concludes happily. The production is directed by Robert Binder, with musical direction by Paul Salter, choreography by Judy Brown-Davis and Batya Feder, and sets designed by Roxane Goodkin-Levy, the team that has brought so many fabulous productions to Jerusalem (Aladdin, The Wonderful Wizard of Oz, Iolanthe, and many more). The principals include such Encore! stalwarts as Aviella Trapido, Rafi Apfel, Bezalel Manekin, Mordecai Buxner, and features Roy Doliner in the title role and Sandy Cash as the formidable Katisha. The spirited ensemble is composed of veterans and newcomers of all ages, including several youngsters in their initial appearance with Encore! Tickets are on sale online at www.encore-etc.com/order-tickets or by telephone at (054) 578-9006, with an early-bird discount applicable through Sunday, 10 December 2017. Don’t miss this opportunity to see The Mikado in all its grandeur, coming soon to Jerusalem!